Learn Gentry Stein’s advanced Chopsticks style combo, Bass Jump. Because there are so many chopstick elements in this trick, if you keep a few tips in mind, it is going to help you with each element. First, when landing the chopsticks, make sure you keep the string on the tip of your fingers. This is going to open up the string a lot more and give you more space to land. Also, as you are transferring between chopsticks, make sure to keep the string tight and do not give the string too much slack. 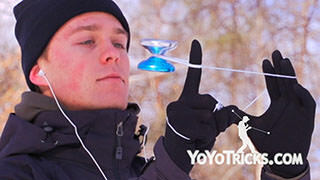 And last, try not to move your hand to the yoyo too much, instead let the yoyo move into the mount each time. 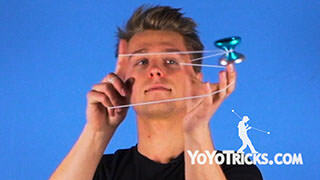 The trick is going to start by wrapping the string around your yoyo hand. You are going to do this by putting your thumb in front of the string for the wrap. As you do this, you want to do a pinwheel which is going to give you more time to land. After the pinwheel, you are going to swing the yoyo on to the chopstick mount on your yoyo hand. As you do this, you are going to set up the chopstick on your opposite hand by inserting all of your fingers into this string and putting your thumb on the top string. Next, you are going to pop the yoyo out of this mount on your yoyo hand, into the chopstick mount on your opposite hand. As you can see, the string is on the tips of my fingers, which like I said earlier, gives a lot more space for the landing. 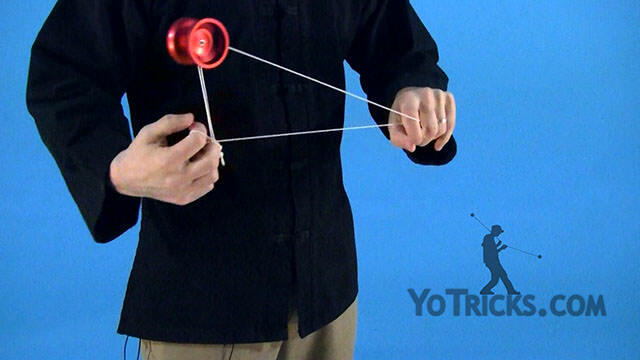 Next, you are going to pop the yoyo into another chopstick mount that looks just like the first landing, except this time your yoyo hand is going to be turned inverted. In order to make sure the string does not slide off like this, you want to push your pinky down into the string. You will notice that the string is now wrapped around my pinky to ensure that is does not slide off my hand. Right after that, you are going to pop into another inverted chopstick, this time with your opposite hand. You will see that my opposite elbow is pointing outward to put my hand in a much more comfortable position to land. You will also see that my yoyo hand is down by my hip to make sure the string is tight during the transition. To make sure that the string does not slide off your opposite hand while turning it, just push your hand into it for the entire turn. To set yourself up for the next pop, you are going to put your pinky and ring finger in front of this string. Then pop into the front facing chopstick mount again. You will see that your pinky and ring finger on the outside of the string here block the string from sliding off. Next you are going to take your middle finger away from the string. Do a pop off your thumb and put your thumb under the string. Then turn your palm toward the sky to land in the chopstick mount. Then you are going to do a pop to your opposite side and put your thumb in front of the string to create the chopstick mount to land in. Then you are going to do a motion similar to before, and do a pop to your yoyo side and bring your palm toward the sky to land in the chopstick mount. Even though the motion was similar to before, you will notice that the chopstick mount is different this time. Right after that, you are going to do an eli hop to your yoyo side and land in the same mount as you were just in. Then do an eli hop to your opposite side and what you are going to be doing there, I said eli hop but it is actually kind of a mixture between a hop, a pop, and an eli hop. You are going to pop the yoyo out and put your thumb in front of the string there again to land in that chopstick. After that, you are going to pop the yoyo to your yoyo side, and while the yoyo is moving outward, you are going to untwist the string from your hand, and put your palm facing outwards. As the yoyo is coming back in the same direction it came from, you are going to catch the string in between your thumb and middle finger. After you land the yoyo in the mount, you are going to pop the yoyo out of the mount. With your opposite hand you are going to hook the string with your middle finger, and insert your index and thumb into the string. 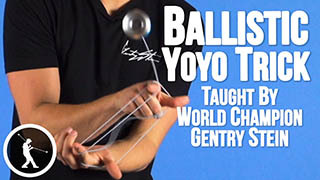 This will set you up for when the yoyo is popping back to your opposite side, and you are going to land the yoyo back in that chopstick with your palm facing the sky. Next you are going to pop the yoyo out to your yoyo side, and as you do that, wrap the string around your hand by leading with your pinky and your ring finger. 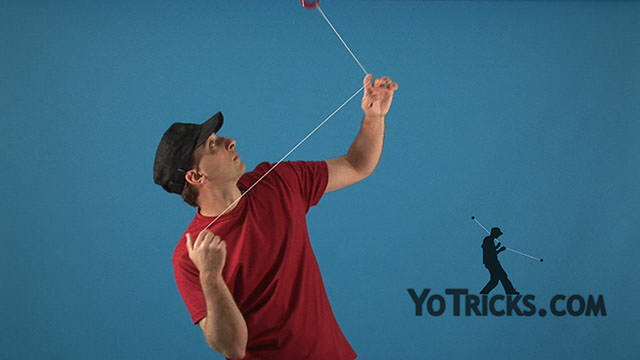 As you pop the yoyo out, put your yoyo index finger under the string and cross your opposite hand under your yoyo arm. That should leave you on that front string, which will set you up for a branding. After you swing the yoyo back over to your yoyo side, then do a double branding. This will put you in a chopstick mount right here inside the branding formation. Once you are there, you are going to swing the yoyo back over to your opposite side and land in this chopstick mount with your arms crossed. As you can see in this formation, my opposite palm is facing the sky, so I am going to pop the yoyo over to a chopstick mount with my opposite hand, but before I can do that, I have to turn my hand in so that it sets up the chopstick for you to easily land in it. Then what you are going to do is, you are going to pop the yoyo up and uncross your arms, then recross your arms, and move your opposite hand to your yoyo side. You will end up landing in this chopstick in your yoyo hand on your opposite side. Next you are going to pop out of the mount into a trapeze, dismount to bind, and that is Bass Jump.